But a growing cadre of this statistical owning class is now crafting a healthier relationship to the rabble at their doorstep. Responding to Occupy and other movement moments, young people with wealth are organizing the resources of their peers and families to level the playing field—and support one another in the process. As a teenager, Ebrahimi was gifted a pool of wealth from his high-tech entrepreneur father. Growing up Iranian-American during the Iran-Iraq war was part of a “perfect storm” that led him to punk rock and radical politics, though for years Ebrahimi continued to identify more as a musician than an organizer. It was only later that he would conjoin his background with his beliefs. “I wasn’t even 100 percent sure they were compatible at first,” he explained. “I approached philanthropy pretty agnostically in the beginning.” Shortly after graduating from MIT in 2002, Ebrahimi founded the Chorus Foundation using $25 million of his personal money. Focused on funding projects to address climate change, Chorus is dedicated to “working for a just transition to a regenerative economy in the United States.” And unlike other foundations, Chorus has a built-in expiration date: intending to spend out the entirety of its—and Ebrahimi’s—reserves by 2024. While he expects another gift from his father at some point in the future, he says it will go toward a “Chorus Foundation Round Two” with the same goal. Having grown up in a “solidly Democratic” household, Lateiner’s family never discussed money around the dinner table, and he struggled to explain his circumstances even to close friends. “My inability to talk about money or class on a personal level has definitely ruined relationships and cut off opportunities for relationships,” Lateiner said. “I mean that as friendships and romantic relationships and everything in between.” Having taught for six years — something he described as “the best way, within my liberal framework, I could think of to give back”—Lateiner came across an article in the New York Times in 2012 about young, socially conscious heirs, including Naomi Sobel and Resource Generation executive director Jessie Spector. “The ground started to shift under my feet,” Lateiner remembered. Not only were Sobel and Spector speaking openly about their wealth and about giving it away; they were happy about it. He looked Resource Generation up online and quickly became involved. 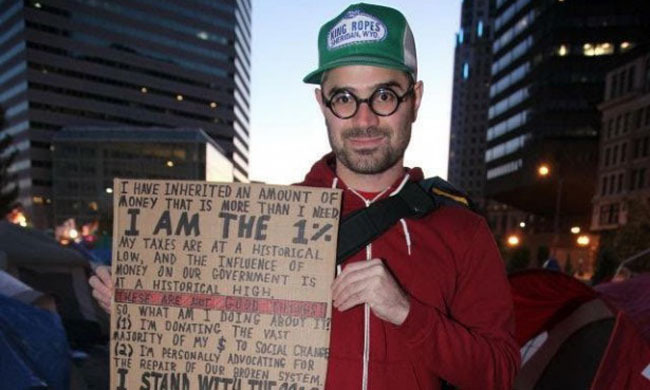 This collective organizing alternative to wealth therapy emerged from “being able to be with people who understand [the problems of having wealth] and can honor them to get past the guilt.” A national, chapter-based organization, Resource Generation serves as a space for both support and political education among young people with wealth. More recently, it has also become a platform for them to leverage resources toward “an equitable redistribution of land, wealth and power.” An initiative launched last year called “It Starts Today” collaborated with racial justice groups around the country to raise $1.4 million for the movement for black lives and other black-led organizing. Apart from Solidaire, Ebrahimi also noted that Occupy marked a kind of sea change among more mainstream funders’ circles, who are now more open than ever to cross-issue conversations centered on justice. Black Lives Matter co-founder Alicia Garza, for instance, was invited to speak at the Environmental Grantmakers’ Association’s annual conference this year—a small step, but something Ebrahimi said would have been virtually unheard of just a few years ago. For solutions, they turn to movements. As opposed to Carnegie, this new breed of philanthropists reject their so-called “obligations” to capitalism, and are eager to help build a fundamentally different economy. “When we respond to the crisis of income inequality, we’re really responding to the crisis of consolidated wealth,” Ebrahimi explained. “What that says to me is that we’re trying to create a world in which there is no radically consolidated wealth. Without that, you don’t have any foundations”—or, at least, any wealth therapists. Kate Aronoff wrote this article for Waging Nonviolence, a national, nonprofit media organization that fuses powerful ideas and practical actions. Kate is an organizer and freelance writer based in Philadelphia, whose writing has been published in Waging Nonviolence, Dissent Magazine, AlterNet, and The New York Times. Find her on Twitter at @katearonoff.